In SSM colours. Photo taken at Port Adelaide, February 1981, by Ian Warner. Photo taken off Port Lincoln, 28th February 1984, by John Paston (Master). 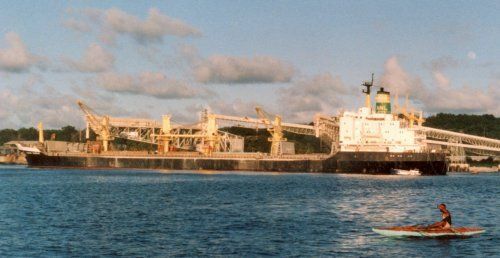 Loading phosphate at Nauru, 14th August 1984. Note new ANL funnel colours. Photo by John Paston (Master). Tonnages: 20,819 gross, 11,510 net, 32,490 deadweight. Cargo Handling: Fitted with four deck cranes 0f18 tons SWL suitable for grab handling. Engine: Mitsui 7 cylinder B & W DE 7K7 4 EF oil engine. 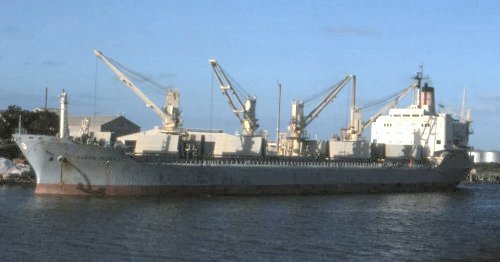 April 1977: Completed by Mitsui Engineering & Shipbuilding Co. Ltd., Chiba, Japan for Baron Murray Shipping Co. Ltd., Scottish Ship Management Ltd., Glasgow, managers. Bareboat chartered to British Phosphate Commissioners. August 1981: Returned to owners and bareboat chartered to The Australian National line. 1987: Sold to Seafarer Shipping Co. Ltd. Acomarit Maritime Services UK Ltd. Hong Kong flag, renamed TAIMA. 1988:	Sold, renamed HANSA EXPLORER. 1989:	Sold, Croma Maritime Ltd. Iason Hellenic Shipping Co. Ltd., managers. Cyprus flag. Renamed CARAVOS EXPLORER. 2003:	Sold, Germtrans. Falcon Shipping, managers. Mongolia flag. Renamed BRAVERY FALCON. 2006: Renamed GLORY FALCON, same owners & flag. 2009: Arrived Chittagong 6th March to be broken up. Beached 12th March.